Do you love your skin? If so, you’ll be surprised to find out that on average, a woman (or even man) wears more than 500 chemicals from beauty products she applies on a daily basis and most of them are harmful to the skin. Yikes! That’s crazy. I admit I’m one of those people who sometimes skip the part where the ingredients are listed. My excuse: if my skin looks great with this product, then I can’t be bothered to read the back label anymore. So now, I actually took my own sweet time reading my favorite brands’ microscopic list of ingredients (I believe it’s done on purpose so you strain your eyes and just give up) and have discovered many horrific things enough to convince me that I’m a walking chemical time bomb and I should start going organic soon. Please share this infographic to your family members, relatives, friends and co-workers who are probably unaware that they are wearing these toxic chemicals every single day. You just don’t know it, this might save their skin from long-term irreversible damage. Previous story Is Love Really Worth It? Taking care of the skin is a must for me. I don’t use a lot of beauty products even though I have a lot on my stash. I do read up and research the ingredients especially when I’m putting the product on my face. Very helpful infographic! Thank you for dropping by, Rea. I have reduced my consumption and dependence on some beauty products like toner and facial wash because they actually cause allergic reactions on my skin. I hope more people are aware of the amount of junk they’re putting on their faces and bodies. Whenever I find a certain product effective for others, I easily grasp and do the same to my face/skin without the knowledge of what a certain product is for and “side effects” to my skin. Thanks for sharing that infographic! You’re welcome, Lou. Not all skin types are the same, so what works for others might not work for you. You should always try and experiment them at first. I learned this the hard way when I used a soap recommended by a friend, only to get some major acne in the end. Never again, haha. Wow. Now I’m glad I don’t wear make up! I still wear makeup though, but only on special occasions. Wow very informational. Good thing I’m too lazy to wear that much amount of makeup. That’s great, Rose, but I would still recommend that you check out the label just to be sure. Honestly, I’m not really familiar with the other harmful chemicals! shame on me. I have paraben-free products too but not sure with the others. Now I have to revisit my beauty products and re-read their labels! Haha! Thanks for this! You’re welcome, Janine. 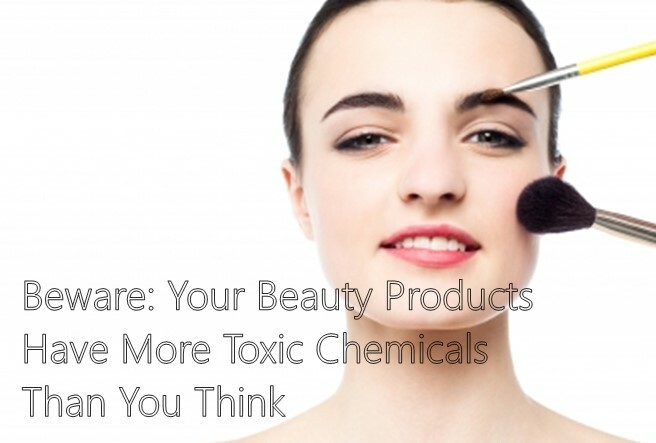 I found out lately that some of my beauty products have harmful ingredients disguised as good. Had to throw them away. Yes, anything with strong fragrance may cause allergic reactions. I found that out the hard way when I used Victoria’ Secret perfumes and got pimples on my neck and body. Have you tried Cetaphil products? I heard they are great for the skin especially for the face. I must admit it’s hard to go organic when the price difference is significant. Human Nature is my good alternative when switching beauty products. True, true. I have heard about Human Nature but I have not tried it yet. Maybe it’s time that I should research about them. Is the product good? wow! i never thought it will be this bad for my skin! thanks for sharing this! No problem, Jean. Please share this infographic to your friends if you find this helpful. Thanks. OMG! I was not giving any attention to the ingredients of my beauty products but after reading this one, I suddenly become curious and mindful of it. Thanks!